Ensure you are running Linux (kernel 3.8 or later) and have Docker (version 1.10.0 or later) installed. If you are on OSX and you are using Docker Machine ensure that a VM is running and configured before downloading Weave Net. To set up a VM see the Docker Machine documentation or refer to “Part 1: Launching Weave Net with Docker Machine”. After your VM is setup with Docker Machine, Weave Net can be launched directly from the OSX host. Weave Net respects the environment variable DOCKER_HOST, so that you can run and control a Weave Network locally on a remote host. See Using The Weave Docker API Proxy. With Weave Net downloaded onto your VMs or hosts, you are ready to launch a Weave network and deploy apps onto it. See Launching Weave Net. 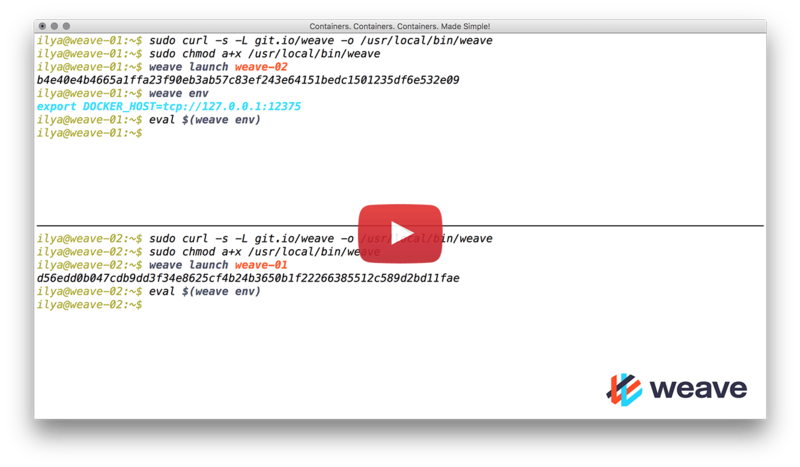 Weave Net periodically contacts Weaveworks servers for available versions. New versions are announced in the log and in the status summary. Amazon ECS users see here for the latest Weave AMIs. If you’re on Amazon EC2, the standard installation instructions at the top of this page, provide the simplest setup and the most flexibility. A special no-overlay mode for EC2 can optionally be enabled, which allows containers to communicate at the full speed of the underlying network. To make encryption in fast datapath work on Google Cloud Platform, see here.